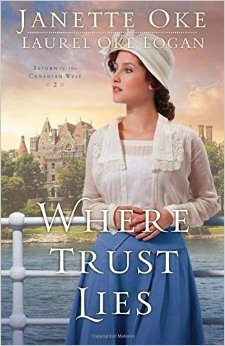 Where Trust Lies by Janette Oaks is the second book in the Return to the Canadian West book series. The main character, upper class Beth Thatcher, has just returned from working in a poor community in the Rockies for a year, and is quickly whisked away on a cruise with her family. She has to deal with readjusting to her more affluent lifestyle in the east while reacquainting herself with her family after months away from home. The book follows her return home from the West and subsequent departure on a cruise. It’s filled with a number of twists and turns, a few which are predictable, and a few which certainly aren’t. The book focuses on the family dynamics and flushes out the individual characters and their relationships well. Not having read the first book in the series, which I assume covers Beth’s time teaching in the Rockies, I was still able to understand the storyline, character relations, and motivations behind actions in the book. While it could easily be read as a stand-alone novel, Where Trust Lies will leave you wanting to read the other books in the series. Janette Oaks engages the reader well through her writing, and adds depth to the main character through her experiences in a community very unlike her own family. While Oaks weaves in an almost fairytale-like love story, it isn’t the feature plot line in the novel. She uses it to enhance the plot line, not lead it. I thoroughly enjoyed this novel and would recommend it to people who like historical romances and people who like a strong female main character. Oaks’ portrayal of Beth Thatcher in the novel shows a woman who is strong, independent, and willing to break away from the ordinary, yet respectful and family-oriented. Where Trust Lies is a quick read, but it’s well worth the time. I received a free copy of this novel from Bethany House Publishers in exchange for my honest review. I was not compensated for my opinions. Previous Post Mary or Martha?